Just a suggestion for next Station is it ok if we don't have to find the monsters every time and have some sort of day care? excited to see where this goes. reminds me of pokemon and cave story. Hehe cool glad to see you've try all creatures ! howdy get the other creatures? oh thanks man I was able to find that tho from like 2 days after the post i a made thnx! Omg I really like this. Obviously has some strong influences but it's really able to create its own identity. I especially love all the creatures; they have so much charm in them. My main criticisms are that the camera seems a bit overly quick in movement and that the wand mechanic seems underutilized, but neither of those were gamebreaking by any means. Are you still working on this project? I don't want to put any pressure on you though, it's still a really great standalone demo. Oh yeah I saw that on your Twitter and it looks super cool too! I'm excited for both! So much fun. My kids and I really enjoyed it! By the way, it works fine on macOS via Wine. Looking forward to the full game someday! This was soo enjoyable! The art style is amazing and the game mechanics are really fun. I cannot wait to hear when there will be more content, game is gonna be great. My favorite part was going back through and trying out the different creatures and trying to find all the secrets. Loved this game! Thanks for the feedback man glad you like it ! Only 15 minutes in and I'm already under the game's spell. It's unbelievably charming. Can't wait for the full release! For some unknown reason... My computer didnt want to run it. I give your game three thumbs up. Two were mine and the other I found. I enjoyed your demo very much, and I look forward to the games full release. I'm glad you liked it too. I was happy to try your game out. Please consider contacting me with updates. My viewers offer feedback on my channel on the games I play. Also, I know your fellow developers would love to hear your opinion on their games too. Great demo, I really loved the art style, character design, and sound design. Also the leveling up your weapon/character mechanic was pretty fun to see. In terms of criticism I would say the main thing is that the mechanics felt a bit disjointed in terms of presentation and story. I guess this could be fixed by further explanation in the plot but I wasn't sure why I was a station officer in training and how that had to do with collecting monsters with a wand to use as weapons. It's a cool mechanic but maybe tying it more with the setting could help. Also at times the combat felt a bit dry, especially because there is an incentive to clear out all the enemies, and some enemies don't really do anything (the shadow guys just stand in a place and emit dark splatter for example). Lovely game. Very cute. Great graphics. One complaint: Pressing start to pause, then start to unpause on a controller quits the game. Thanks ! yep I need to fix this stupid thing, thanks for the feedback ! I really enjoyed the heck out of this demo. The wand was a fun mechanic and just the right amount of challenging in certain places. (I was playing with a controller so maybe it was more floaty than intended, but the challenge was fun) It took me a while to figure out how to beat the boss but once I did I couldn't stop smiling. I've played it a few times since then and oddly enough, never noticed the text that said there were three secrets to be found in the demo so I went back in for more fun searching. I've found two it I can't find the third one. There's a suspicious sewer wall/grate but even my wand won't last too long out there so I don't think it's a speed accuracy thing. But I really like this and look forward to a full game some day. yay. update. FOUND THE THIRD SECRET. 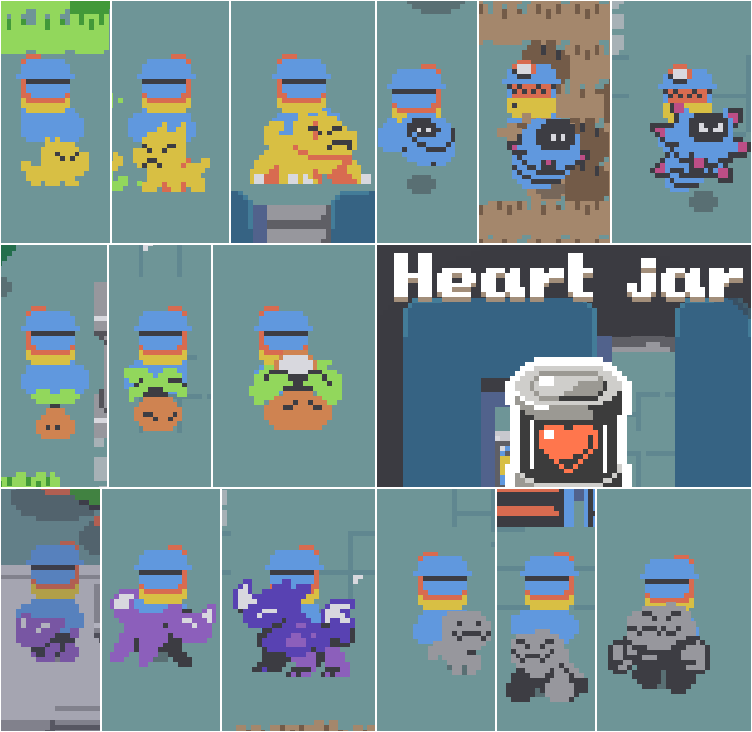 heart jar was what I was missing. yay! this got me to come back to it a lot. Hehe nice job :D thanks for the feeback and glad you enjoyed it ! This game is reeeally polished and good for a demo. The cool charming artstyle and gameplay mixes together perfectly. Its like pokemon ranger meets secret of mana and am liking it. My only criticism is the puzzles. The switch mechanic puzzle could get repetitive so adding more puzzles would be good. You could hopefully add more creatures. There are so many shooting styles you could use. Hopefully more boss fights too but anyway this game has a lot of potential and am looking forward to the next release. OH. Will the other versions down the line and the full version be free? Suuuuper cute! I loved the character designs a lot and the combat was really fun, especially during the boss fight at the end. I think the teleport gun loans itself really well to making interesting puzzles and bosses. As for some criticism, the controls felt kind of cramped on my keyboard. I wish they were more spread out. Also, I think it'd be nice to have health drops last a little while longer before disappearing. It wasn't too bad, there were just a couple of times where enemies blocked health, and in defeating them, the health disappeared. how do you open things? I got to the sewers, and it seems like u have to open the drawers there. what is the button to open stuff? Keys are G,H and J, I need to add this infos at the start sorry ! Really charming little game, I'm curious what it will lead up to! -The character moves faster diagonally than he does when moving on 1 axis, feels a bit funny. I'll fix this things thanks for the feedback ! Great job buddy! Really proud of you! Thanks for the video ! About the audio it's really weird, Have you try to relauncn the game ? There is audio in the game, but I already have this problem at some launch. Thanks for the heads-up, it might be related to my firewall, which prevents any network activity by default from applications. I didn't check for individual settings and just turned it off temporarily and then sound worked. Thanks ! feedback is really appreciated, I'll try to fix all of this for the full game, anyway glad you like the game in overall ! I had alot of fun with this! The art is really refreshing, and the gameplay a mix of pokemon, zelda and cave story. Everything feels like good quality. My only complaint is the controls. I played on a keyboard and g,j,k feels very foreign to hold my hand at. The music would get very repetitive really quickly as well. Would love to see more in the full game! Thanks man ! About controls maybe X,C,V will be better ? or you have another idea ? And yep indeed the music is too repetitive I will think about that for the full game ! I think you should favor WASD as that is the default pc controls. So maybe J,K,L? This puts your hand at a comfortable spot where you don't have to move them in any un-natural way. I loved the game, it looks really good. The gameplay is very creative, I loved that you could choose which monster you use to attack and also the level up system. The only thing that I got a bit annoyed with were the controls. Maybe it's because I played with a gamepad, but I just walked into the horny brushes sometimes. Also the movement of the Wand is a bit wonky but I think that is also kind of intentional. The boss at the end was also pretty fun, but it took too much time. Maybe make him have less health. Althought it's just a Demo. this feels like it has a lot of potential. There is a lot of character. I would call it a Top-Down Cave Story. Thanks for feedback and all this positive things ! I agree with you about the controls and the boss duration I'll fix the most as possible for the full game. And probably obvious, but I really like Cave Story so thank you for the comparison !